My name is Amanda, and I have a son who is addicted to Lego. Clearly the solution to this addiction was to take him to the nearest Legoland, stat! 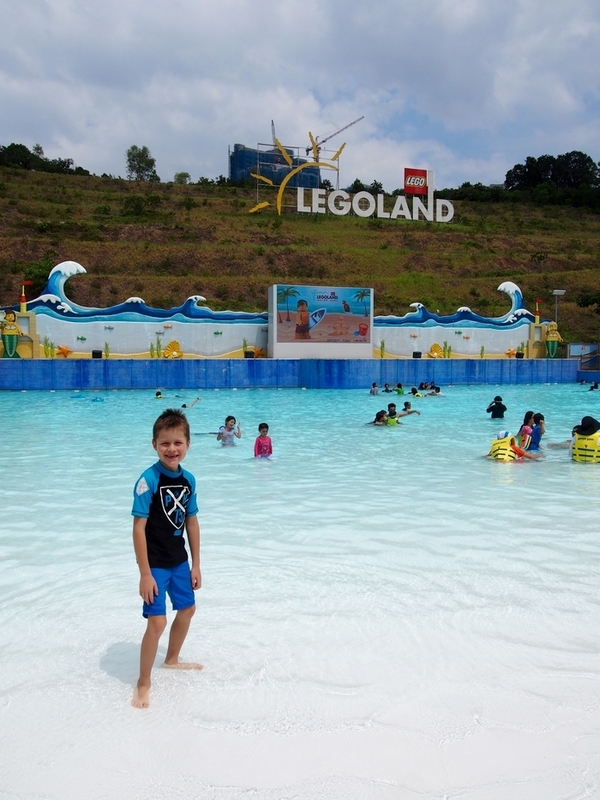 Legoland Malaysia is in Johor Bahru, the southern-most part of Malaysia, and just across the border from Singapore. 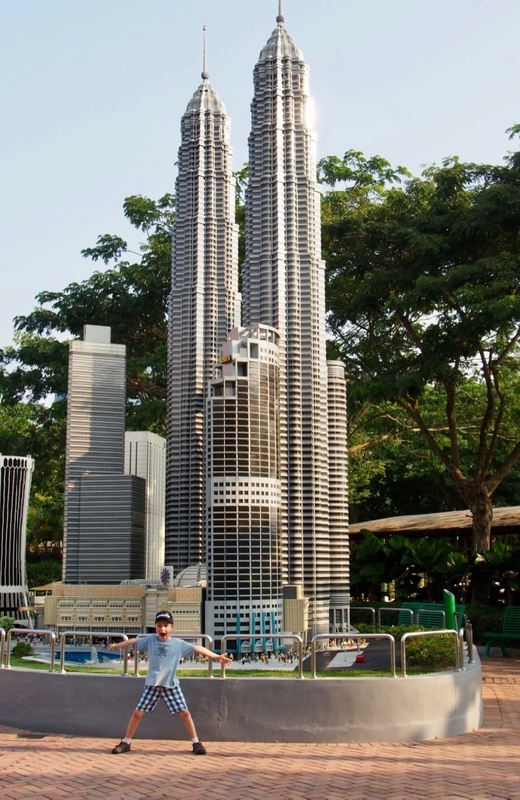 I snapped up some cheap flights to Singapore almost a year ahead and then figured out the Legoland bit later. 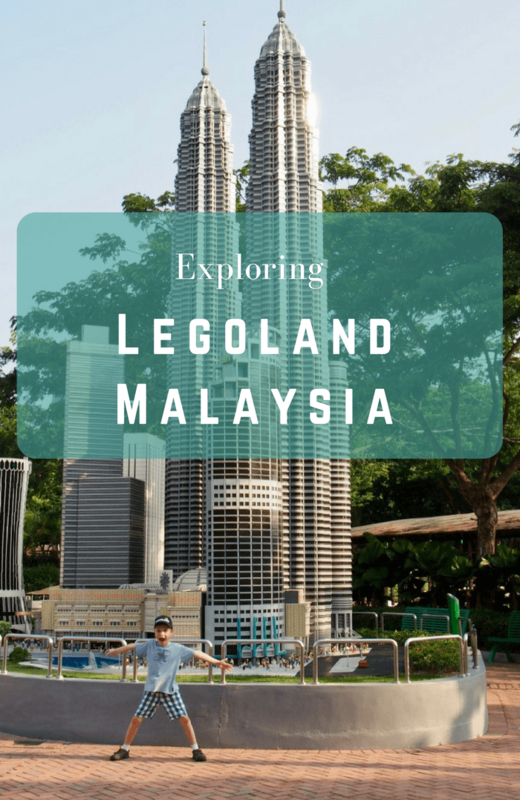 Since coming back, I’ve had a barrage of friends asking for some Legoland Malaysia tips, with questions on organising their Legoland Malaysia accommodation and how to get to Legoland from Singapore. 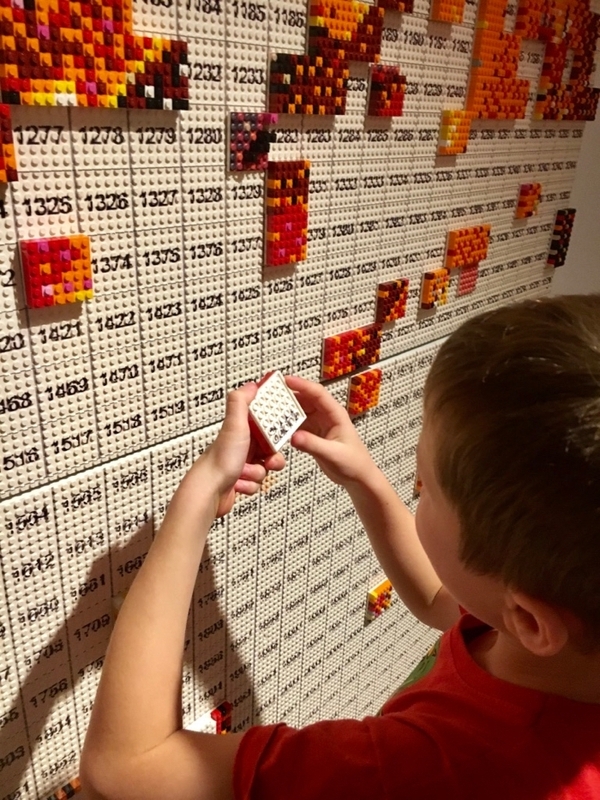 If you’ve got questions left after reading this then just ask, because my son can’t get enough of talking about Legoland and quite honestly, I had such a good time there with him that I don’t mind either! While lots of people take a day trip from Singapore to Legoland Malaysia, that is definitely not my style of travel. It’s possible, yes. 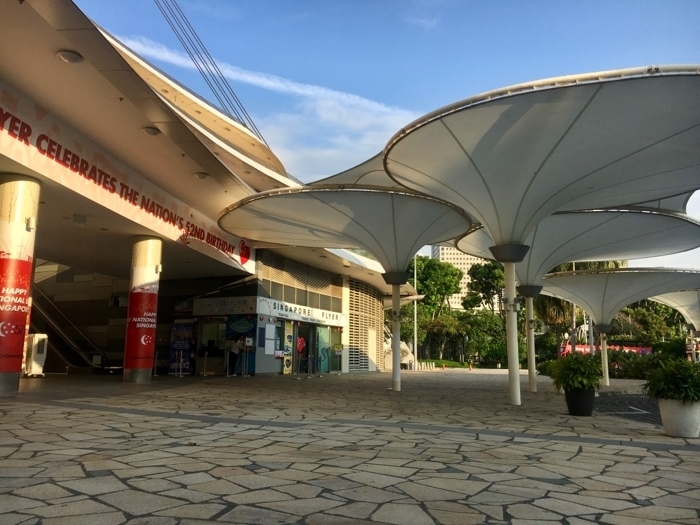 There are bus services that leave Singapore early enough to get you to Legoland around the time it opens, you can spend the day at the park and then go back to Singapore on a bus leaving between 4pm and 5pm. But bear in mind that sometimes the return trip, thanks to long queues at the border, can take three hours or so, and that seems like a way to make a really fun experience at Legoland be eclipsed by unfun memories. I can’t imagine how we would have felt if we had done it all in one day, but I don’t think it would have been good. 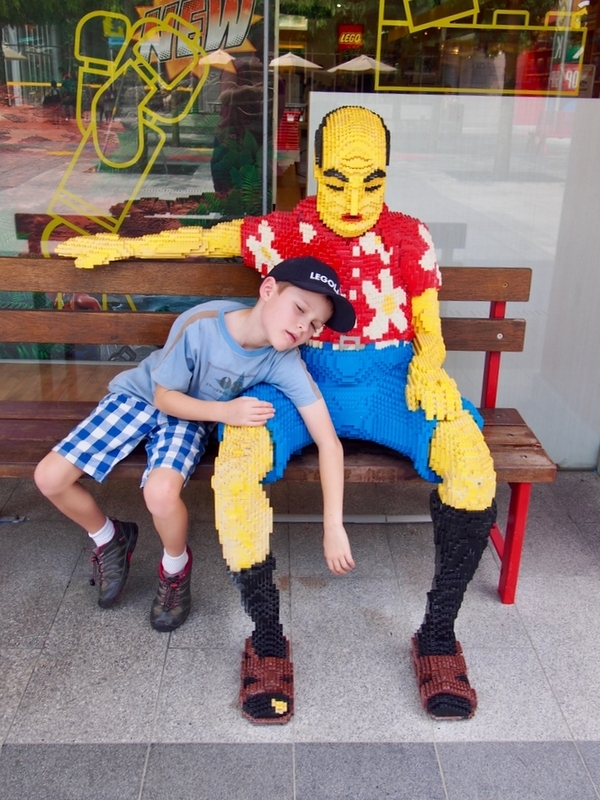 It’s best to take Legoland Malaysia slowly so you don’t end up like this! On the first morning, we took the bus over (full details on that at the bottom), arriving at the park late morning and heading straight for the Legoland Malaysia Water Park. We spent a couple of hours there, had lunch, then got changed out of our swimming stuff and spent the rest of the day at the Legoland theme park before heading to our Airbnb apartment for dinner and a good sleep. The next day we headed to the hotel to drop off our luggage (as we’d booked the second night to stay there) and were lucky enough to be able to check in early – at 10am! So we swapped our plans a bit and spent the full day at the hotel – there is heaps to do there. We checked out of the hotel the next morning to spend another full day in the theme park before bussing back to Singapore. And we loved it all. Our previous Legoland Germany experience didn’t include a water park (there wouldn’t be too many warm enough days in southern Germany!) so my son and I were super-excited about this. It’s pretty much always swimming weather in Malaysia, and it was lovely and warm on the day we arrived. 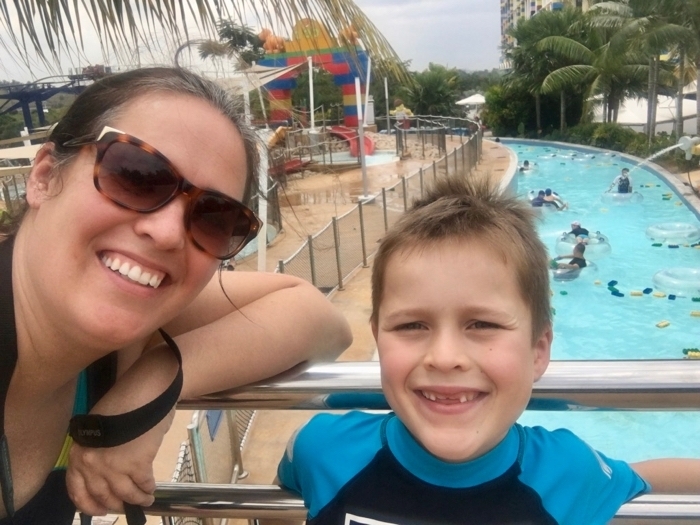 You can buy a separate ticket to the Water Park, or a combo ticket so you can go to the theme park on the same day – or even a combo to do both over two days, coming and going as you please. 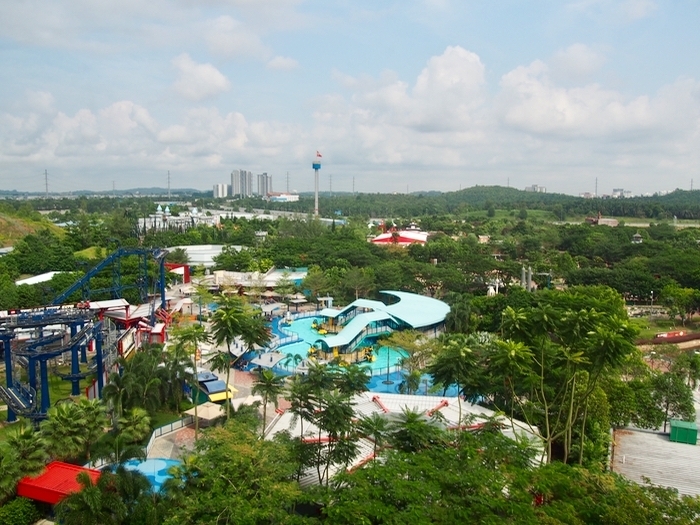 The staff (and signage) recommend going to the Water Park first because if tropical rain comes it’ll generally be later in the day, and there are quite a few indoor attractions at the main theme park. We got into the Lazy River first and it was glorious. They have large rubbery Lego bricks you can use to build a raft, but it’s pretty difficult to build a sturdy craft – my son managed to get one that would hold him for a while, but by the time he’d done a circuit of the river he was clutching one brick! 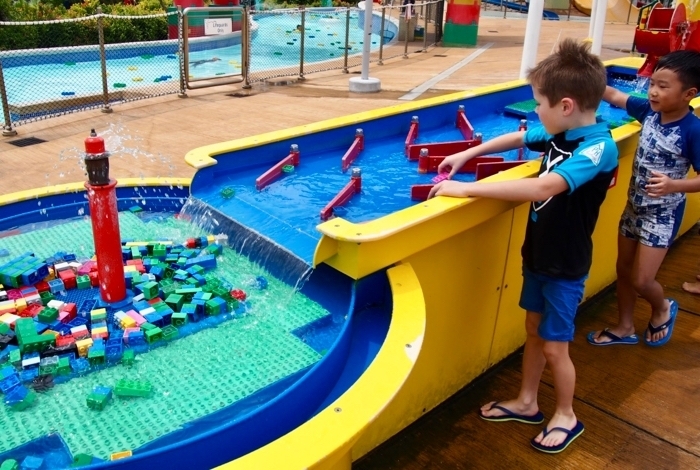 There were heaps of other opportunities for building in the Water Park – several areas with lots and LOTS of bricks where we could build boats or anything else that would float and send them down along flowing water. One used pre-made Lego boat hulls and we spent quite some time trying to perfect the best boat and beat each other. I claim I won, but if my son had a blog he may have a different opinion. My very favourite part of Legoland was the wave pool. Weirdly I loved the setting with the Hollywood-esque Legoland sign above it, but also I just loved floating around in the water. The waves are pretty tame and occasionally get bigger, enough to be fun. It was quite the cultural lesson, too, as we saw lots of adults donning life jackets and I had to explain that in other countries, it’s not the case that everybody learns to swim (it’s pretty much a given here in Australia, and all kids go to swimming lessons); we also saw Muslim visitors swimming in all-over swimsuits and so my son got a bonus religious differences lesson too. 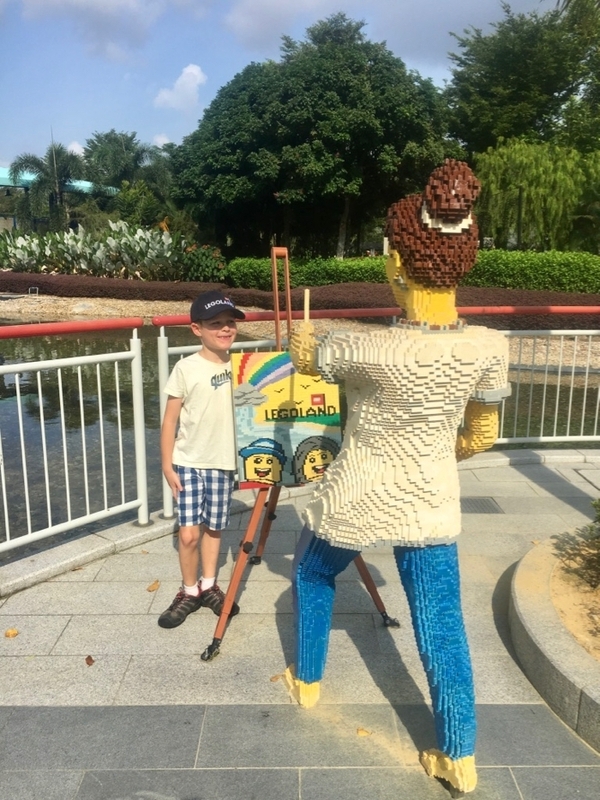 I actually really loved the whole many-cultures part of Legoland Malaysia – while most visitors were from Asia, they were definitely well spread from many different Asian countries. Before we changed and headed to the main theme park for the rest of the day, we stopped for lunch at the cafe next to the pool. I had satay chicken because I’m addicted to satay, and my son’s eyes lit up when I said “they have Lego fries!” And yes, they really had fries shaped like Lego bricks. Perfect! 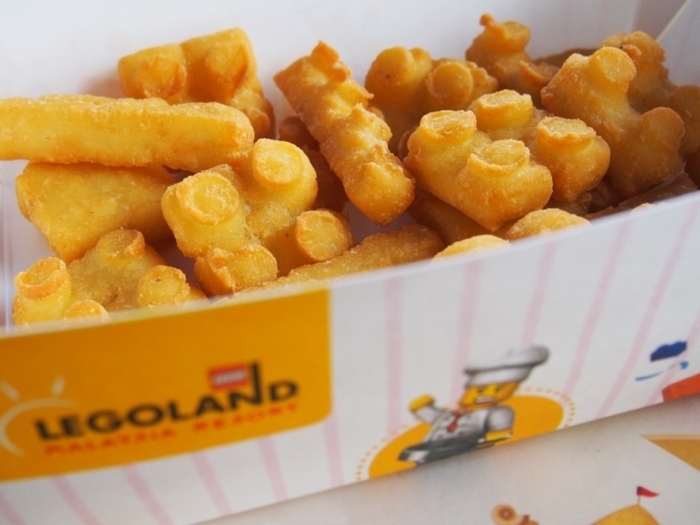 Who can pass up Lego fries? Our lunch at the Legoland Malaysia Water Park. You’re not allowed to bring food into the park, and of course, captive-audience-style, the food is considerably more expensive than in more everyday parts of Malaysia, but it’s not over-the-top and it’s pretty tasty for a theme park. The outdoor Miniland is enormous – get your kids to follow the Lego train which goes on a winding track under and through most of the Miniland, and you’ll realise how big it is! – but there’s more indoors as well. The Star Wars Miniland impressed both of us even though we aren’t Star Wars fans, so I can only guess that if you’re into it, you’ll love it! 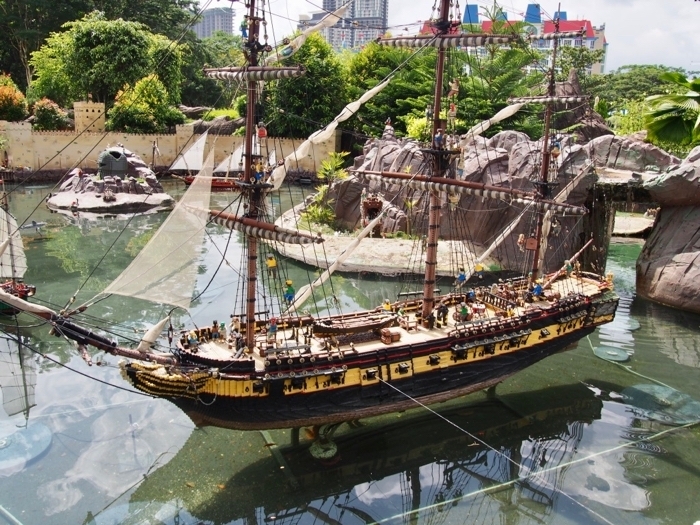 On the outskirts of Miniland we found this pirate ship and it can squirt water out of the cannons at your legs – which was just what we needed to cool down a little! But beyond Miniland, I love that there are all kinds of Lego creations just randomly throughout the park. One of my favourites was this Lego lady painting a picture! 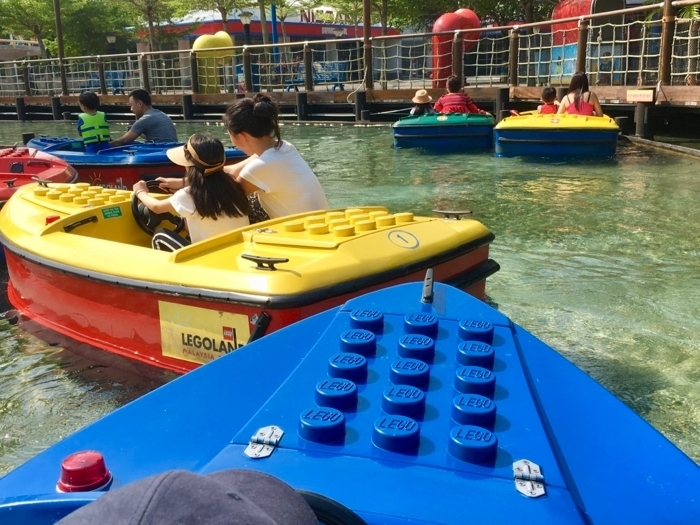 Some of the rides at Legoland Malaysia were familiar to us after our experience in Legoland Germany, and we wanted to try them again. One of these was Boating School, because two years earlier, my son (then aged five) had been a terrible boat driver, crashing all over the place, and he wanted to see if he’d improved! Let’s just say he hadn’t, but we had a lot of fun! This time round my son was old enough to go to the Lego Driving School too and he had heaps of fun there. They show them a safety video and give them some directions inside first, and then let them loose with their Lego cars on the city-style track. Got a big thumbs up! My son got his license at Legoland Driving School! 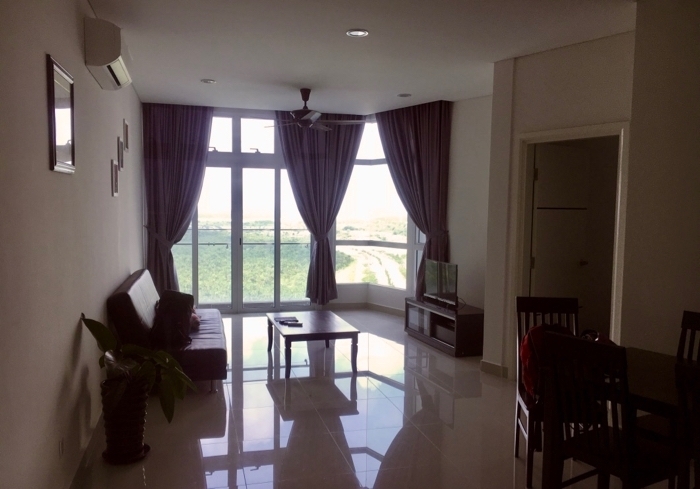 Because a Malaysian day is pretty warm, you want to alternate indoor and outdoor activities, so I was pleased to find heaps of good stuff to do indoors. (You might also want to escape tropical rain but it never rained on us, despite the forecast saying it would.) The 4D movies were great – check the timing so you can plan them into your day, they run every half hour but when we visited there were four different ones to choose from. But my favourite indoor activity was in the Lego Academy. 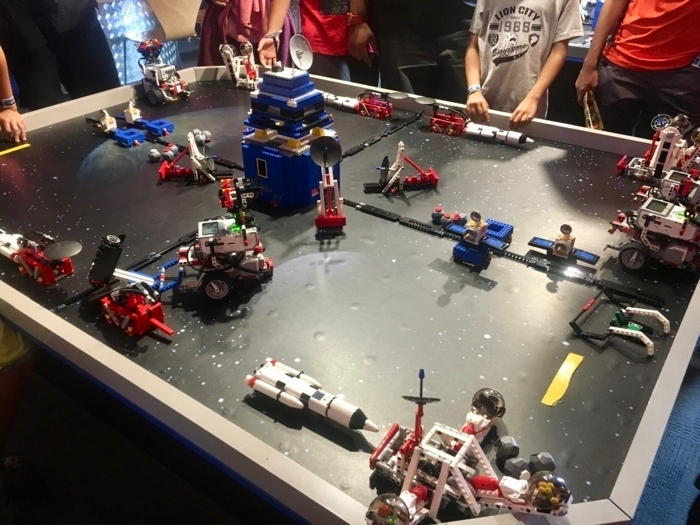 We got to take part in a robotics workshop, programming these Lego robots using Lego Mindstorms to complete some space-related tasks. Kids should be eight or over (yes I fudged my son’s age by six months, but I knew he could do it!) and you can enrol for a class for free at various times during the day. Highly recommended! 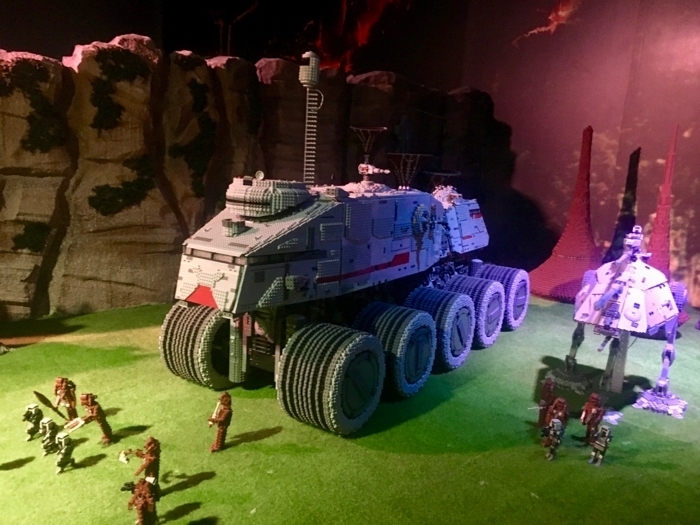 One of the reasons I’d wanted to take my son to another Legoland as soon as possible was because the rides and attractions do skew pretty young compared to the average theme park. 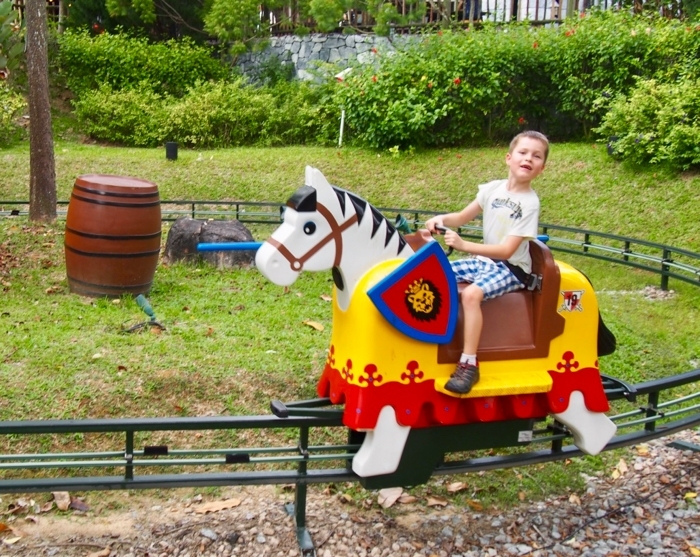 Fortunately at seven he was still keen to go on some of the younger kids’ rides as well – and since there was pretty much nobody there, he could go on every ride without queueing – so he had fun doing a few laps with this horse in the Kingdoms section! Our favourite ride – remembering both of us are kind of wimpy with rides – was the Dragon’s Apprentice, the “training” rollercoaster for the bigger one! 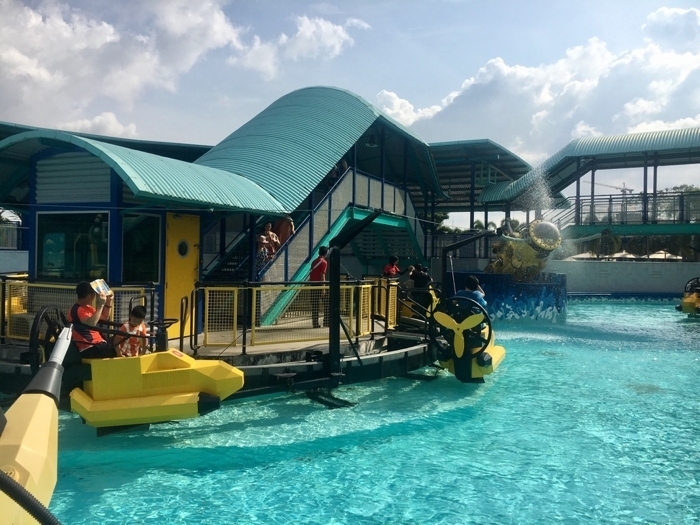 But we also started and ended our second day in Legoland on this ride, the Wave Racers, both because they were fun and because you could get wet and we needed a bit of a cooling down! 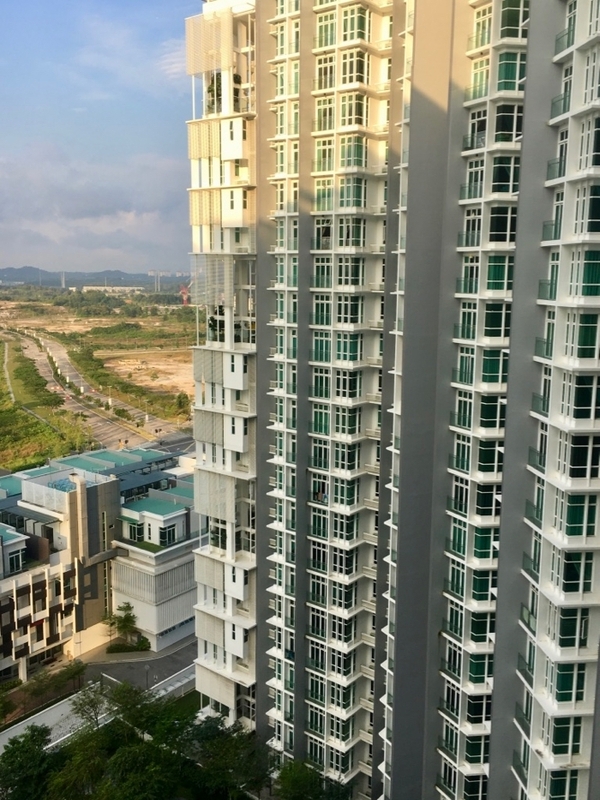 My initial plan was to spend two nights staying in an Airbnb apartment in Nusajaya, Johor, which is a five-minute car trip from Legoland or, in theory, a short walk (in practice, you have an exhausted kid with you …). The cost was around a fifth of staying in the Legoland Hotel because I was arranging it a little bit last-minute. 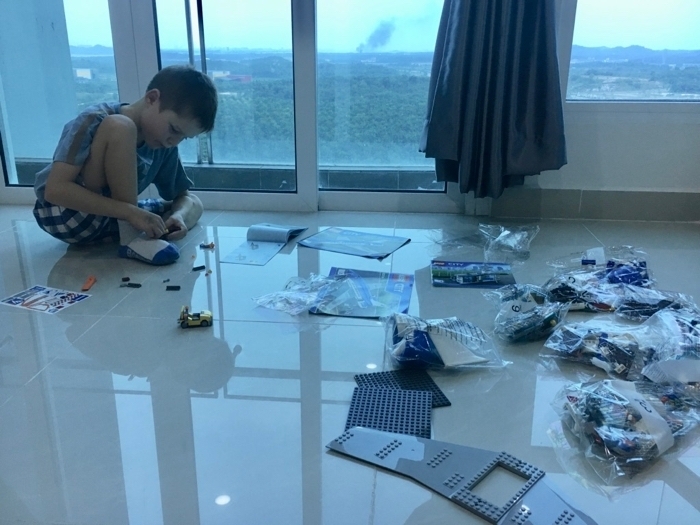 But my son got wind of this and begged to spend one night at the hotel (and more on that later, I’m glad we did) but if you’re wanting to keep this a budget trip, then I’d highly recommend sticking with the Airbnb option for staying near Legoland Malaysia. Within site of Legoland, there are a bunch of new apartment buildings, all in the town (or suburb, I’m not sure – it’s all new!) of Nusajaya. 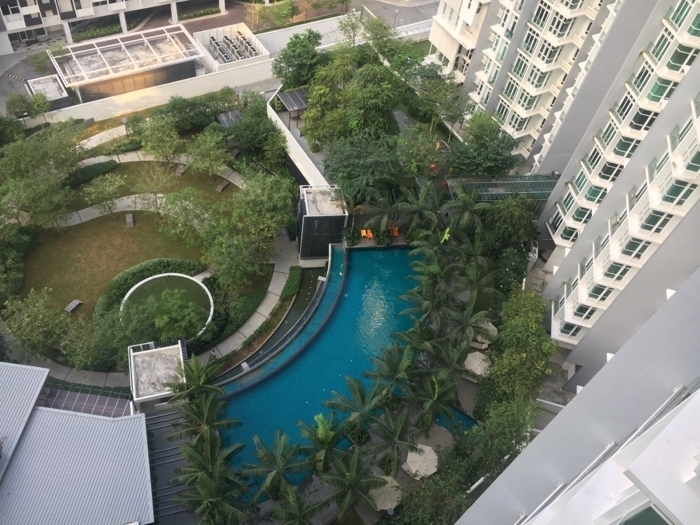 From a quick hunt on Airbnb there are heaps of possibilities depending on how many people are in your group and most, if not all, of the apartment buildings also have access to a swimming pool which is great for the kids in the humid weather. Most importantly … there was plenty of space for Lego building. My son found a bargain at one of the stores in Legoland – the prices are generally the same as in Australia but they had a few items on sale for nearly half price, so yes, we somehow managed to squeeze a huge Lego plane and airport into our luggage, even though we were travelling carry-on only! I am a long-term fan of Airbnbs (especially after the amazing places we found to rent in Iceland) and this was such a great option for Legoland. If you were staying in the area longer to look at the other parks – Hello Kitty Land, a Thomas the Tank Engine park and coming from next year, Sealife – then it would be ideal for a stay of a few days or even a week. 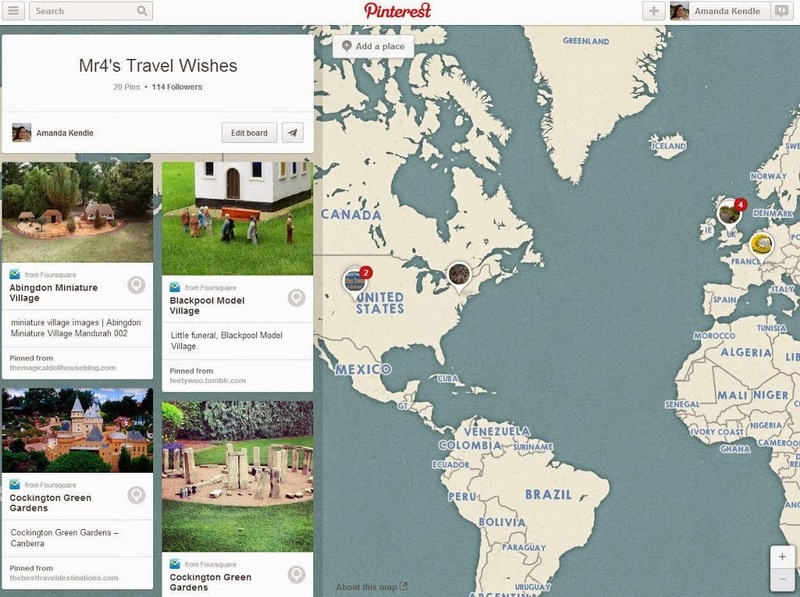 If you haven’t used Airbnb, use my link to sign up and get $30 off your first stay. 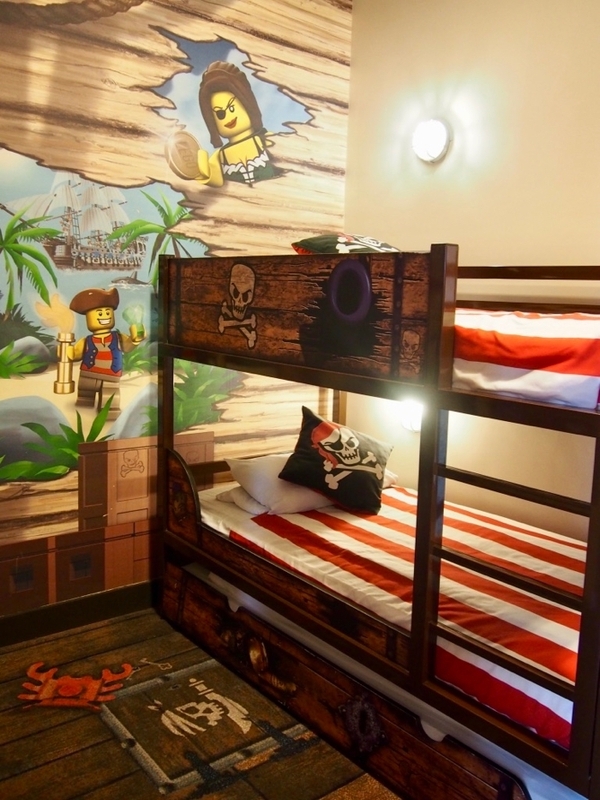 For my son, staying in the Legoland Hotel in Malaysia was an absolute must. YouTube had already shown him what it looked like (it’s so annoying when kids learn how to spell and can find these things on their own!) and he was desperate to spend time there. I have to say that in retrospect, I’m glad we did, as it was very special and definitely a lifetime highlight for him! We were lucky that when we went to drop our bags in at ten in the morning, they said our room was ready to check in, so we got to spend nearly twenty-four hours there, and we seriously did not run out of things to do. My son picked a pirate room for us (there are also Kingdoms rooms with knights and castles, Adventure rooms and Ninjago rooms) and the first thing he wanted to do was solve the puzzle and unlock the safe – which he knew would hold some Lego prizes he could take home. The pirate bunk beds were a hit and of course he slept in the top bunk. I had a huge bed and could see over the theme park from under the cover – pretty cool! I’d expected the bright colours and pictures to be a bit overwhelming but it’s done tastefully enough that it’s quite tolerable for parents too! What I liked most about the hotel is that there were plenty of different areas to explore. 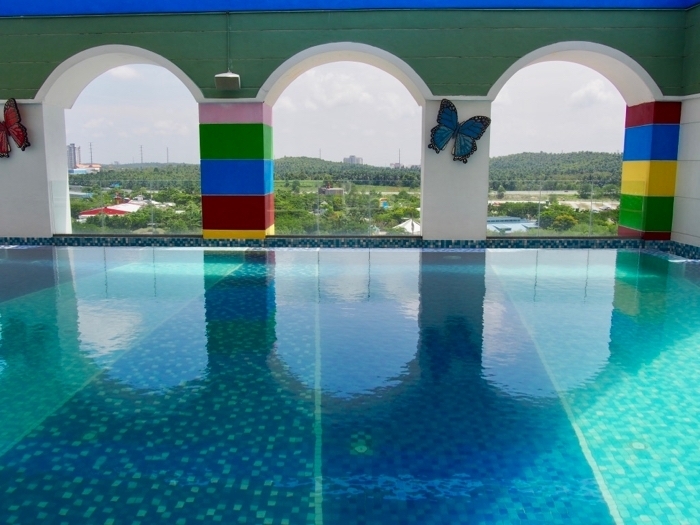 There were two adjacent swimming pools, one deep and one shallow, with lots of rubber Lego bricks to build with in the shallow one, similar to the Water Park. In the lobby there were three separate areas with bricks for building – every time we walked past one, my son would spend at least half an hour building (sometimes much, much longer!). And the Italian restaurant at night had a clever set up, getting kids to colour match small Lego blocks onto Lego squares which then went to form a bigger picture, mosaic style. It was a great way to keep the kids busy but not noisy until the food was served. (Incidentally, that food was surprisingly good – I wasn’t expecting amazing Italian in a Legoland hotel in Malaysia but I was very impressed!). 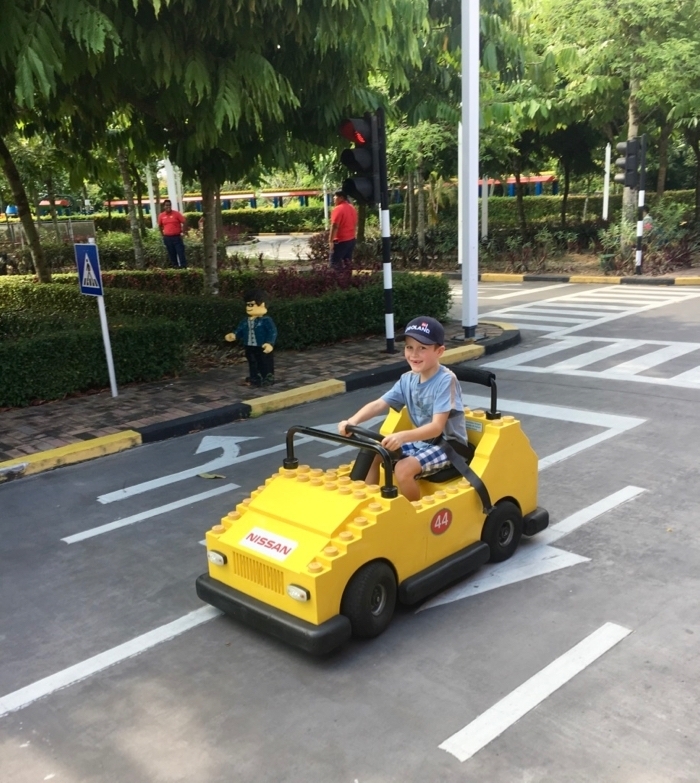 Lots and lots of people head over to Legoland from Singapore every day so they’ve set it up to run pretty efficiently – notwithstanding the chance of a long, slow border crossing. Buses go from various landmarks in Singapore – I booked from this site which seemed to offer lots of different companies – and we chose to go from the Singapore Flyer since it was close to our hotel. Trips range from S$10 to S$15 so it’s pretty reasonable and it probably only makes sense to use a different method if you’re travelling with a big group. The only dreary part about this whole process is the border crossing. Even on our way to Malaysia, the process of actually leaving Singapore took ages. Your bus stops on the Singapore side, you all pile off and get in a long queue. The fact that even kids had to give fingerprints to leave the country (my son wasn’t asked to do so when we flew in) made it extra slow, I guess. Entering Malaysia was much quicker – we had to give fingerprints there too and it didn’t seem like they had that many more staff but it was just much faster. You have to wait for everyone on your bus though we Aussies were invariably some of the last – locals have separate, faster queues. In our case, the worst part was coming back. Without a border the drive would be less than an hour. We breezed through the Malaysian side but then our bus sat for ages in a bus traffic jam, before it got to the point where it could let us out. We then stood in the Singapore immigration queue for two entire hours before we entered the country again. That wasn’t including getting our baggage scanned or the bus getting in and out of there. We felt okay (ish) because we’d had a slow start to the morning and a leisurely second day in the park, but I couldn’t help thinking that if we’d done the day trip that so many recommend and had already stood in the queue that morning, that our whole Legoland experience would have been ruined! 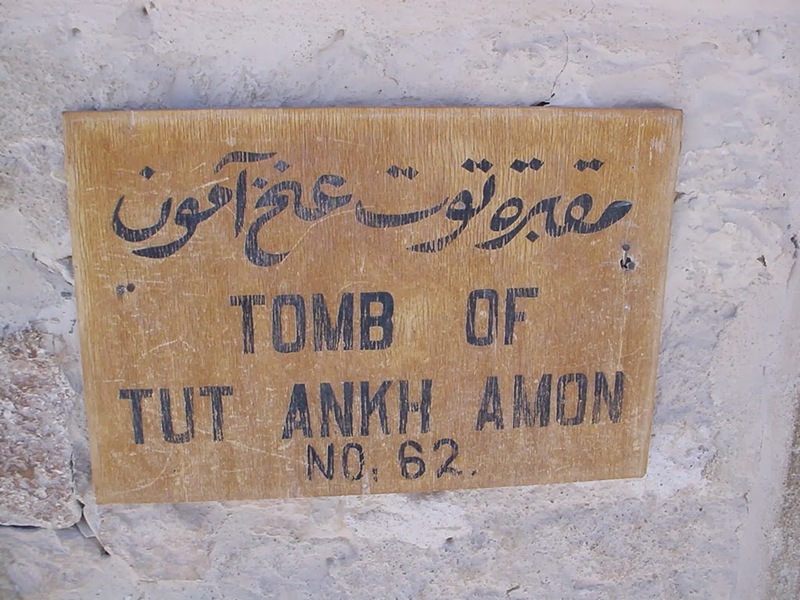 One mistake we made was returning on a Sunday evening – so avoid that if you can! If you have a bigger budget and can take a private taxi or other kind of transport, then you could go at a different time to all the buses, and avoid some of this waiting time too. But although it was a long return trip, it was otherwise smooth and straightforward.